Propagation for last weekend's CLE activity was much better than anticipated. 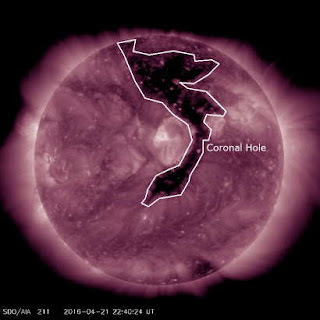 I had resigned myself to a weekend of poor propagation after reading gloomy reports of an impending coronal hole stream about to disturb the geomagnetic field once again. The image on the left came with storm warning alerts beginning on the 23rd, the first night of the CLE. As I usually do, I retuned my inverted - 'L' close to the CLE frequency range and set up my Perseus SDR to make overnight recordings every hour. I capture two-minute files on the hour and during the best propagation times (usually from midnight to dawn), every half hour as well. The next day I review the files, tuning through the band to see what has been captured overnight. As you might imagine, this can take some time but it allows me to take advantage of any propagation peaks that I might have missed had I been listening in real time for just an hour or two. It also allows me to get a good night's sleep! Conditions were noisy, on all three nights, with lightning activity over the western states ... but for the most part had cleared up nicely after midnight. The last night (Sunday) saw the best overall propagation, even with a K index of 2. A very nice, but short-lived opening towards the east, brought an additional 18 more catches that had not been heard on the first two evenings, along with some nice NDB signals from Ontario. 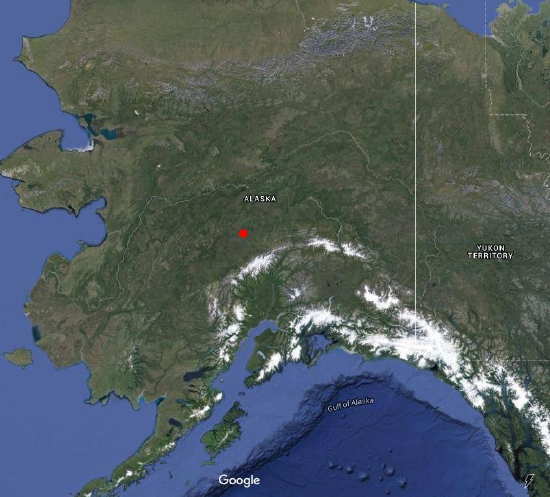 One of the signals I did not expect to hear at this time of the year was MHM, Minchumina, Alaska, on 227kHz. This one is only heard once or twice per season, and propagation to Alaska has to be much better than normal for MHM to be heard. Hopefully you can jump in for next month's CLE activity. The CLE 206 listening results for all North American listeners and those outside of Europe can be found here. In my 'other' life, before retiring, I taught high school for 35 years. I soon became tired of doing my nightly lesson preps and marking of papers on the kitchen table so I built a large oak roll-top style desk, but without the 'roll' part. It had lots of drawers, both big and small, slots and cubby-holes, and made the nightly homework very much more enjoyable. The left end of the desk was occupied by my Sony ICF -2010 and above it, on the desk's top shelf, was a small amplified and tuneable ferrite loop antenna. The Sony was tuned to the 500kHz international MF 'distress' frequency, which was mainly used as a CW calling frequency for ships wishing to work the coastal traffic handling stations. 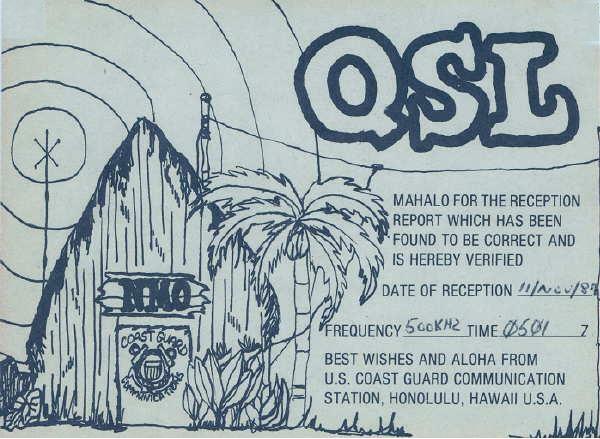 Once contact was established, stations would move to the 'QSS' working frequency used by the coastal, so that the distress frequency was not tied-up. 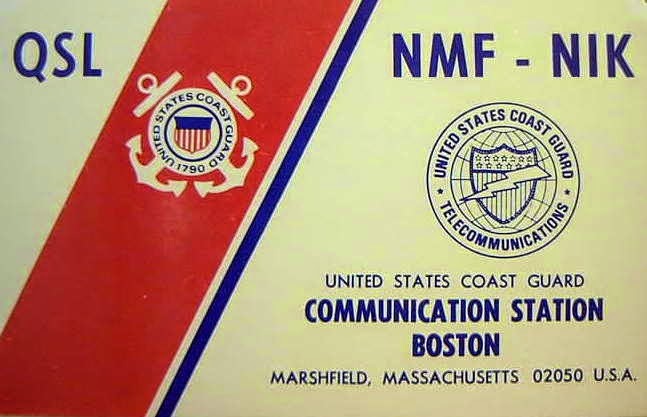 As I sat at the desk doing my nightly prep, the silence would be broken every few minutes with the sound of a CW caller, either a coastal or a ship. It was music to my ears. 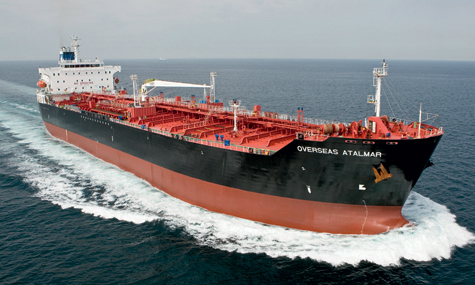 On a normal night, the numerous coastals could be heard with their periodic traffic lists interspersed with ships up and down the coast calling with traffic or weather reports. 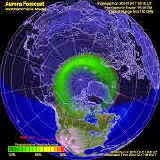 However, on a really good winter night, the frequency was almost constantly abuzz with CW. Ships, as well as the coastals, could be heard from the Gulf of Alaska down to the Gulf of Mexico ... as far west as the Hawaiin Islands and on really rare nights, along the eastern U.S. seaboard. On those nights, 500kHz would sound like 20m CW, even on my little Sony and desktop loop. Thanks to the forethought of those that had the good sense to record some of those amazing sounds, you can step back in time and listen to what '500' sounded like back in its prime ... recorded somewhere in western Europe. 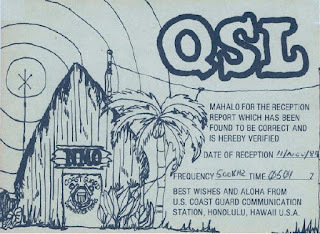 The most recent 630m crossband activity brought back these pleasant memories of what the band could sound like at times, with several very strong VE7's and a few weaker U.S. experimental stations to the south, all busily calling CQ at the same time on various frequencies. I consider it a huge privilege to be able to operate on this much revered part of the radio spectrum ... one steeped in such great CW tradition. I think it won't be too long before 630m will sound much like its old glory days again ... and wouldn't that be a wonderful thing. 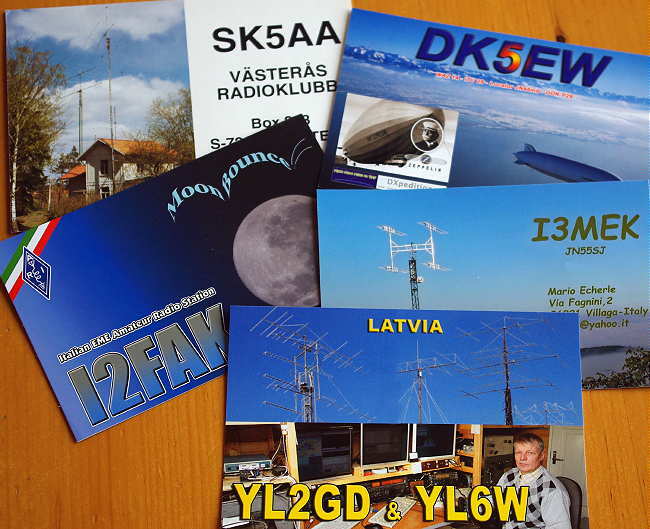 With several QSL's from last month's EME action now arriving, April's 'best days' have just concluded. For me, operating with no antenna elevation, 'best days' mean those with northern-most lunar declinations (these put the moon rising clearly and almost directly out in front of the house, not in the neighbour's trees); not having the moon near the sun and also, having the moon closer to perigee (closest approach to earth) rather than apogee (furthest from earth). With just a single 9 element yagi, every db is precious. ... but I have also found success on days that don't look particularly great, with the moon approaching apogee and it's subsequent higher db path loss. As with most radio propagation, there is also some magic involved and, just like on any band, some days are simply 'better' and for no obvious reason. This month saw six EME contacts, some with stations worked previously, in 2007, and not 'new uniques', while three were new, bringing my uniques total to 73, with this small, horizon-gain assisted system. As summer approaches, it will be interesting to see how favorable the above mentioned variables will come into play as many of the best northerly declination days will also closely follow the sun and its increased background skynoise ... not so much a problem for me but for those bigger stations trying to hear a very weak signal in a noisier sky. 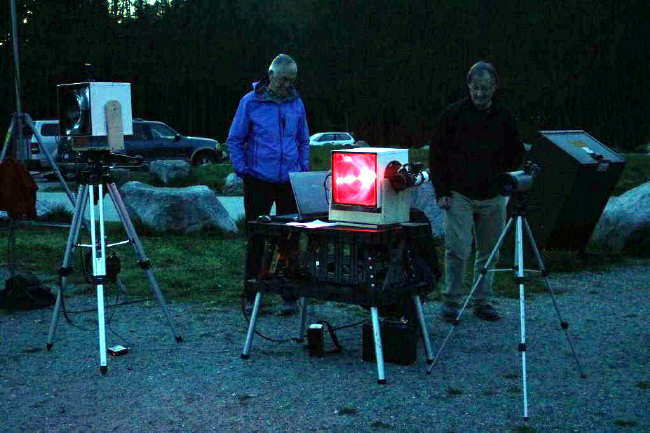 Toby, VE7CNF, successfully inaugurated his lightwave station earlier this week, on Monday night, completing a nice two-way CW contact between West Vancouver (CN89) and Mayne Island (CN88). 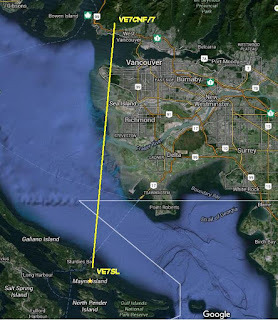 The distance spanned was approximately 51km (32 miles), crossing atop the western edges of Vancouver and then across the Strait of Georgia, the body of water separating mainland BC from Vancouver Island. The details of Toby's homebrew lightwave equipment are described on his web site here and are similar to the station at this end ... also described in earlier blogs. 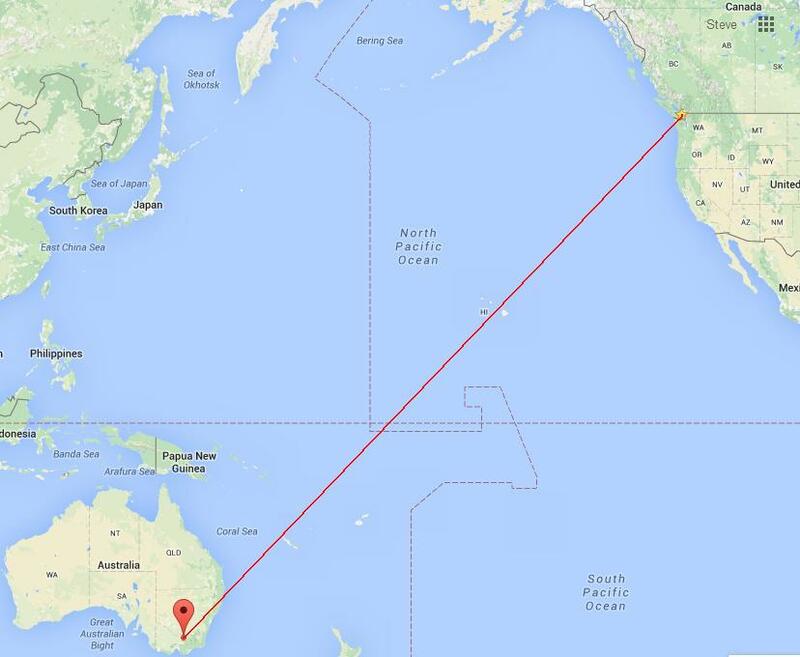 This was the same path covered in my two previous lightwave QSO's with Markus, VE7CA, described here. Monday evening's weather was clear and calm but at this time of the year, true darkness is a long time coming. With a full-moon just a few nights away, the sky never did get very dark it seemed. I set up my end of the path late in the afternoon, just in front of the house. VE7CNF/7 end showing the busy-looking site in operation. Accompanying Toby to the mountain lookout location were VA7MM, his YL VA7MAY and Markus, VE7CA who initially scouted out and found this nice site for our original lightwave contacts. Thanks to Markus who snapped a picture of the diehard lightwave crew! One thing that I noticed on Monday night was the very loud QRM coming from the sodium vapor lighting used on the ski hills just above Toby's location. The resolution of my Fresnel lens was just not sharp enough to be able to isolate Toby clearly without also being saturated with the lighting noise ... from my end, the ski-hill lighting appeared just above his deep-red LED. Although Toby's signal was very strong, the lighting hum was strong enough to cause some receiver front-end desensing and slightly modulate Toby's CW signal with a touch of AC ripple. I did not notice this hum when working VE7CA at the same location a couple of years ago. It's possible that there was no snow on the ski-hill at the time and the lights were not turned on. Moving the receiver just a few degrees to the west made a huge difference, as the hummy background noise level returned to the quiet hush of a dark sky. Toby's recording of my signal is much cleaner as there are no bright lights when looking towards Mayne Island. It is really interesting to hear the rapid fading, almost a flutter, on my CW signal, as the light passes through various levels of ever-changing haze above the water. Midway through our one hour QSO, Toby reported that my signal had dropped measurably as had his signal on my end. Although I could see no obvious clouds in the path, I did notice a red glow out in the Strait that had not been there earlier. When I turned off my transmitter, the glow disappeared, indicating that there was indeed some low level haze that had crept up on us, and enough to cause some signal absorption on the path. Thankfully signal levels returned to normal, and actually were a bit stronger, about fifteen minutes later, when the haze thinned and the skies had grown a little darker. Towards the end of our QSO, I had the chance to test out my #2 receiver. It was built so that I could do some NLOS cloudbounce testing here on the island, without having to separate my main system's transmitter/receiver pairing. At the time, there were no lenses available from the overseas manufacturer, so my quest for a suitable lens led me to a local 'bargain style' hardware importer (Princess Auto), who had a good supply of $5 lenses. The lens seemed to function well in my local tests but it had never been put side-by-side with the higher quality lens in my main transceiver. 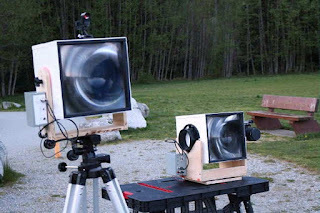 As it turned out, the $5 lens worked very well, easily detecting the 51km signal although it didn't sound quite as loud since the receiver I built for it was intended to interface with my laptop and lacked the additional audio amp I had built for the main system. A final interesting observation was made, when on a whim, I placed a large cardboard shield over the bottom quarter of the transceiver's receiver lens. The signal strength didn't appear to change at all. I gradually blocked more and more of the lens but astonishingly, was still able to copy Toby's CW with all but a 1" strip of the lens completely covered! This would tend to indicate that we would be able to communicate with a very much smaller Fresnel or optical glass lens, such as a 4" or even a 2" inch magnifier. As I commented to Toby on CW, the possibilities for experimentation are endless. 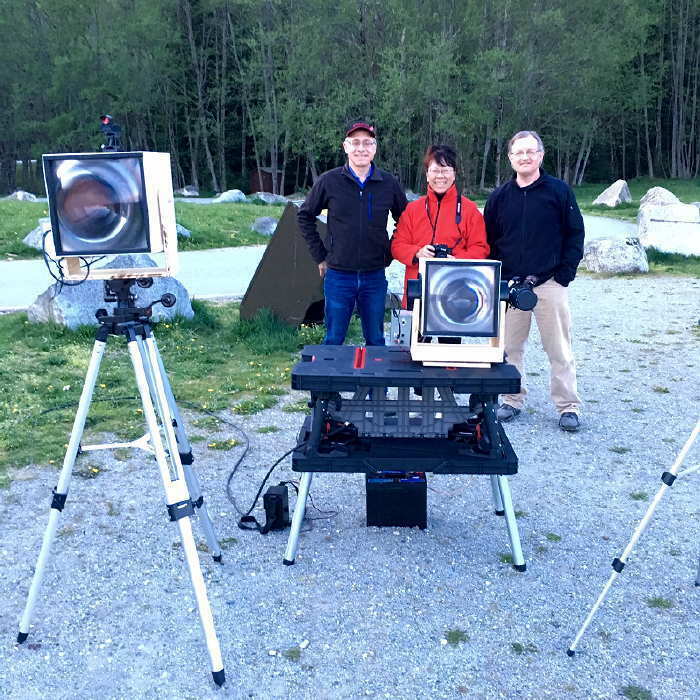 All-in-all it was a very successful evening and the mountain-top gang seemed to enjoy the outing as much as I did, and ... the QSL is in the mail. Hopefully there are other VE7's in or around Vancouver that might be interested in throwing a signal over this way some night ... I'll leave the light on for ya! 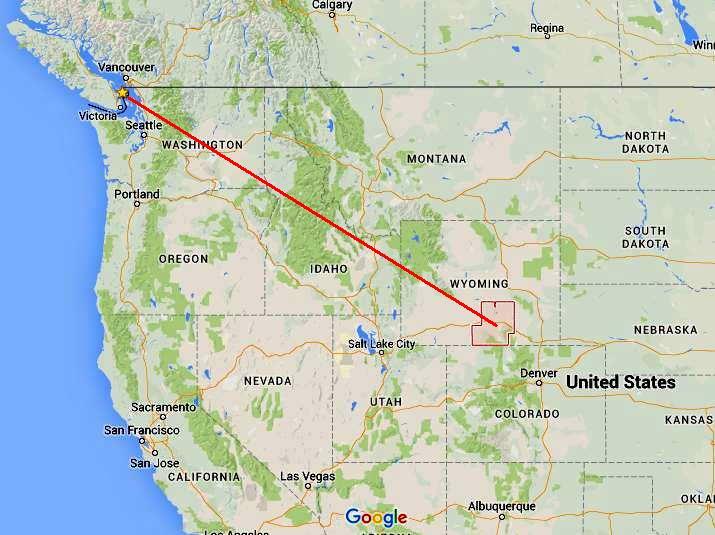 This coming weekend will see another CLE challenge, this time in the LF band from 190 - 239.9 kHz. 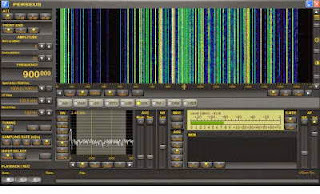 'CLE's' are 'Co-ordinated Listening Events', and NDB DXers around the world focus their listening time on one small slice of the NDB spectrum. 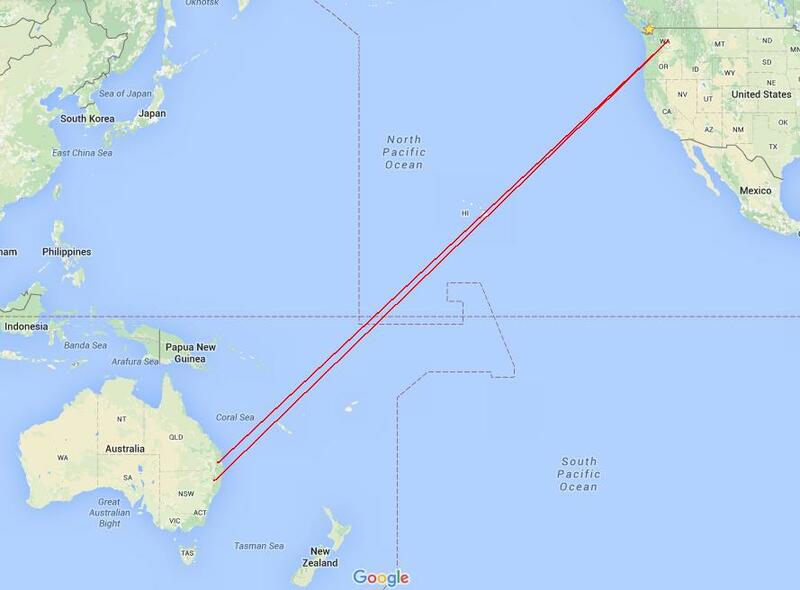 One nice catch to try for is 'LU' on 214 kHz shown on the left. 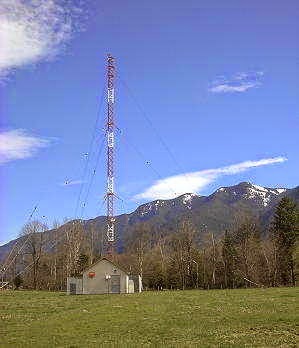 The 'LU' NDB is in a breathtaking location, high on a mountain meadow at the foot of the North Cascade mountain range. In spite of the towering mountain peaks to the east and to the south, 'LU' is well heard, being reported as far east as Massachusetts and as far west as Hawaii. The antenna is a 100' top-loaded vertical with, presumably, an extensive ground system as this is a very large site. The transmitter is a 500 watt Nautel. 'LU' is about 20 miles north-east of the Abbotsford Int'l Airport, Vancouver's alternate. Our 206th Co-ordinated Listening Event is next weekend. Do join in if you can. First-time CLE logs will also be very welcome. Both halves are for everyone to try. NDBs. In Europe there are very few there, but some DX ones might be heard from North America and maybe from a few other places. are scattered across Europe but there are very few of them elsewhere. 'Hot spots' are ENG and ITA. some good catches as a result. might hear some DX ones. We last used these 'rules' for CLE190 in January 2015. (not in an attachment) with 'CLE206' at the start of its title. # The date (e.g. 2016-04-22, etc., or just 22) and UTC. stating the location and owner - with their permission if required. to make further loggings for the same CLE). An interesting item in Global News today caught my attention. In 2012, Glenn MacPherson, a teacher living in Gibsons, BC (a coastal community about 50 miles north of me and line-of-sight) began to hear a low level 'hum'. At first he thought it might be coming from local float plane activity but soon ruled that out. 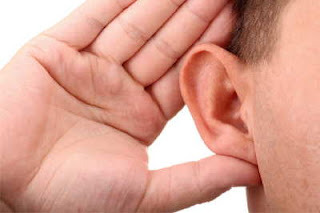 After Googling for any information about possible causes, he quickly learned that he was not the only one hearing ' the Hum' ... so he set up a website where people could report what they were hearing and found that it was a worldwide phenomenon. Possible theories for what has been described as 'hum' and 'rumbling' range from VLF transmissions to submarines to “ 'nothing more than the grand accumulation of human activity' that could include noise from highways, marine traffic, mining, windmill farms, hydroelectric dams and other forms of industry." 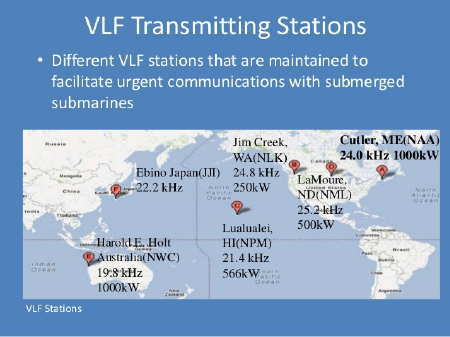 MacPherson speculates that some people may indeed be sensitive to VLF frequencies. MacPherson has now built a large Faraday cage to follow up with his VLF theory. So far, over 9000 reports of the mysterious Hum have been filed on MacPherson's website's database and plans to translate the site into Chinese will likely see that number soon rising. Here on Mayne Island, it is very quiet and stepping outside on a winter night when there is no wind or no waves hitting the beach there is truly not a single thing to be heard, including the Hum. 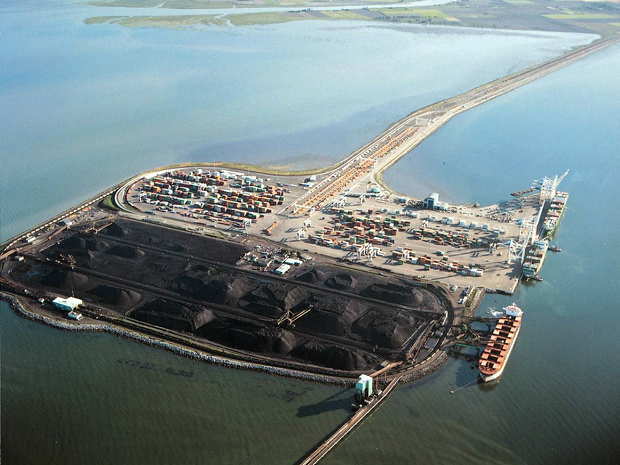 I do however, on warm summer evenings, often hear the rumblings coming from the Roberts Bank coal loading facility and container port, on the other side of Georgia Strait about 12 miles away. I had thought that it might be coming via the seabed and into the rocky sandstone shoreline (the house foundation is built directly on sandstone and there is only a few feet of soil covering the rock along the shoreline) but this doesn't explain why it is not heard in the winter. Perhaps you can hear the Hum as well and might like to report it or discuss possible sources with others. 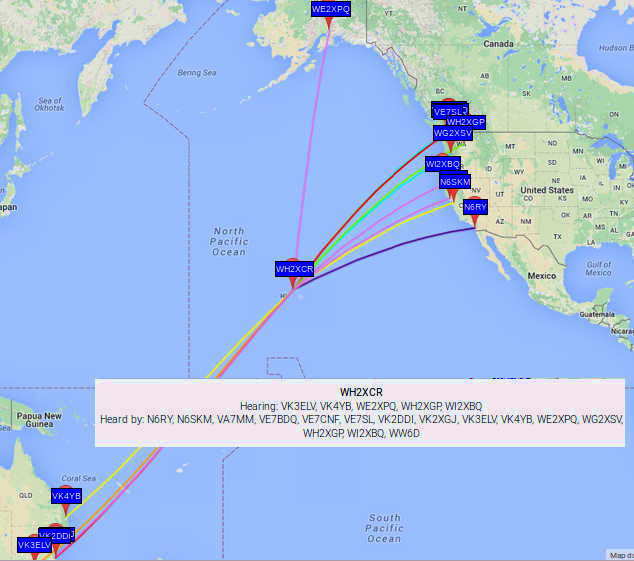 The past few weeks have seen many of the VK 630m WSPR stations making it into North America's west coast and points east. VK2DDI, VK2XGJ, VK3ELV and VK4YB have been the signals most often seen. 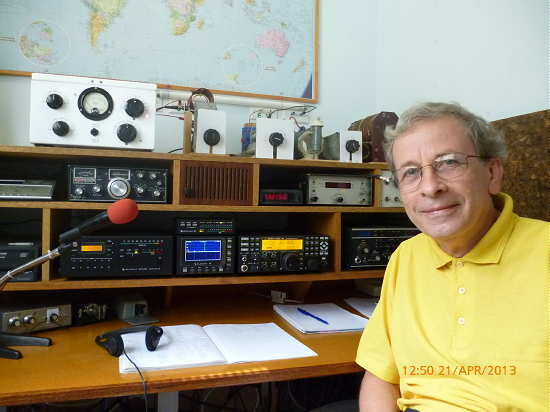 Particularly dominant is the signal from Roger, VK4YB, the northern-most station, located in Moorina, Queensland, near the Pacific Ocean. Roger's signal has been decoded locally by myself as well as VE7BDQ and VA7MM, creating excitement over the more normal nightly spots from the central states. I am a complete novice on 630m. I only came on the band about 2 months ago at the request of a local friend, Peter, VK4QC. That is not quite true, because I was on the band once before, about a year ago and made one contact and then managed to burn out the front end of my Drake TR7, which I had roughly converted to 630m operation. My QTH is atop of a stony ridge on 10 acres. The previous owner said there was some soil somewhere, but I haven't found it yet! Ground conductivity is very poor, I think. If you drive in two stakes about six inches apart, an ohmmeter says infinity. That's if you can drive in a stake. Because after the first quarter inch you hit shale rock. Interestingly the shale layers are at about 60 degrees to the horizontal. There are some quartz inclusions. Yes, I have tried crushing the quartz and panning it - no gold! What is missing from that drawing is that the wire is running North-East to South-West, all in a straight line, with the shack at the North-East end. 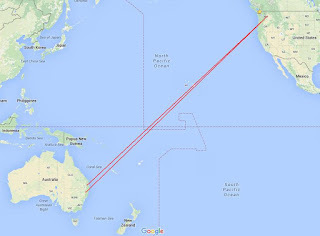 It is line-of-sight from the top of the vertical section to the Pacific ocean. I didn't put the direction on the original drawing because I didn't think it was important. I thought it was essentially a top-fed vertical and would therefore be omni-directional. Nothing could be further from the truth. Experience has shown that it is very directional. I have never had a single report from Japan, and yet my signal has peaked at -3 in Hawaii (about the same distance). Also VK3ELV, using a quarter wave near vertical, gets almost nightly reports from both Japan and Hawaii and at similar strengths. That would seem to indicate a front to side ratio of more than 20dB for my antenna, which is surely impossible? I estimate the feed point impedance is about 3000 ohms. The ATU has 48 turns on the secondary, tuned by fixed capacitors of 960 pF in parallel with a 500 pF variable which is about two thirds meshed. The primary is 5 turns fed by the transverter having a 50 ohm nominal output. The impedance at the top of the secondary should be near 5000 ohms, but the antenna feed wire is tapped about two thirds of the way up the secondary coil, which gives 1.03 : 1 SWR. The earthy end of the coil is connected to the mains earth and the metal work of the shed. I haven't tried terminating the far end. I did think about connecting it to the fence wire that runs round the property but I thought that might be a bit dangerous. There would be high voltage points in places. The transverter output is nominally 50 watts, but it is giving about 90 watts in reality. Like many on 630m, Roger is using an Elecraft K3 into a transverter to generate his 630m 90 watt signal. It is interesting to see the strength of Roger's signal here throughout the night but particularly during the 1152-1156Z time slot. His signal peaked at -18db, right at the level of audibility ... CW levels, but quickly dropped. Throughout the night however, his signal was easily within range of the capabilities of the two-way JT-9 WSPR QSO mode ... had either of us been seriously involved in a two-way JT-9 QSO attempt during that night, it would have been quick work I think. John, VE7BDQ, has already managed to push his WSPR signal to VK on more than one occasion ... this from a typical, suburban backyard inverted-L. The possibilities are exciting, but will mean some middle-of-the-night vigilance! As activity on 630m increases in both VK and VE, we are beginning to see more and more DX possibilities arising, particularly during the Spring and Fall equinox periods when this path seems to peak. As activity in Japan picks up, it is only a matter of time before some of them begin showing up in numbers here on the west coast, as the path to JA has always been reliable and somewhat less demanding than the path to down under. 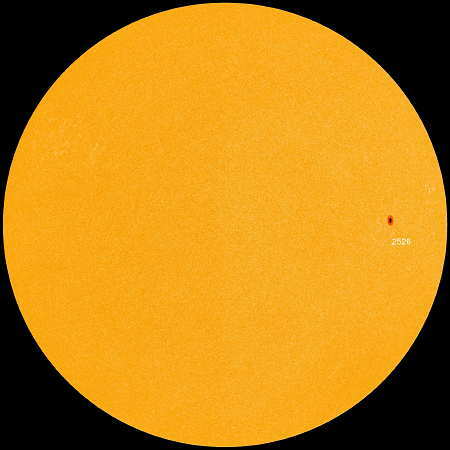 I suspect also, that as the present solar cycle draws down (and supposedly goes 'quiet'), 630m Trans-Pacific signals will grow even stronger, and on most other paths as well. 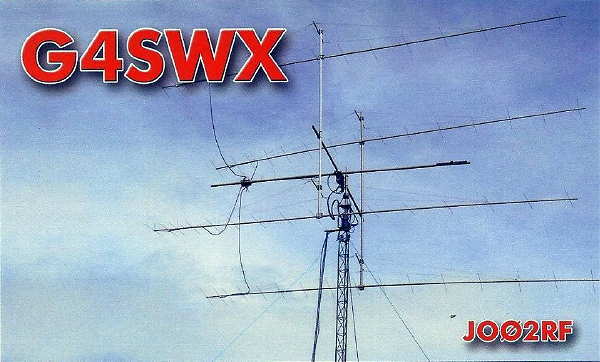 In view of the JT9 QSO possibilities, I think it is clear that I now need to seriously think about building a transverter, allowing me to at least be in 'ready-mode' for the coming 630m challenges ... hopefully for the next equinox. 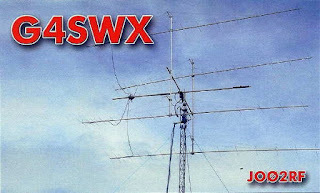 Confirmed DXCC entity #332 arrived in the mail last week. With a total of 339 active DXCC entities, this leaves just seven to go. 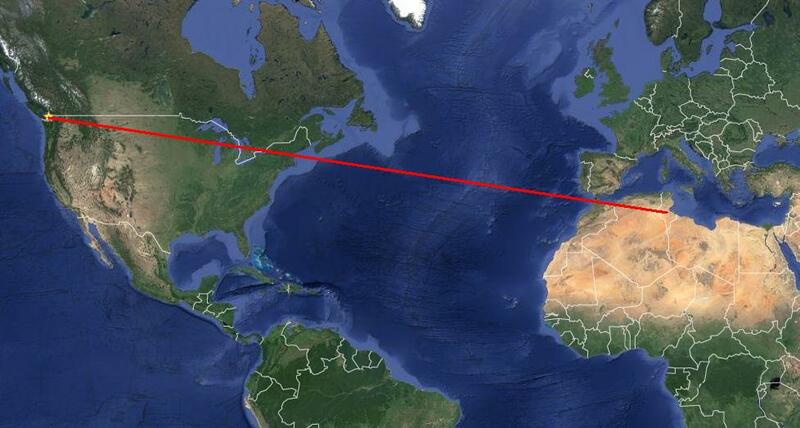 Although I had worked Tunisia a couple of years ago on 15m, I was never able to get the contact confirmed. In spite of sending an SAE and green stamps for postage, 3V8HQ's several promises of his card 'soon to be mailed', proved to be hollow. 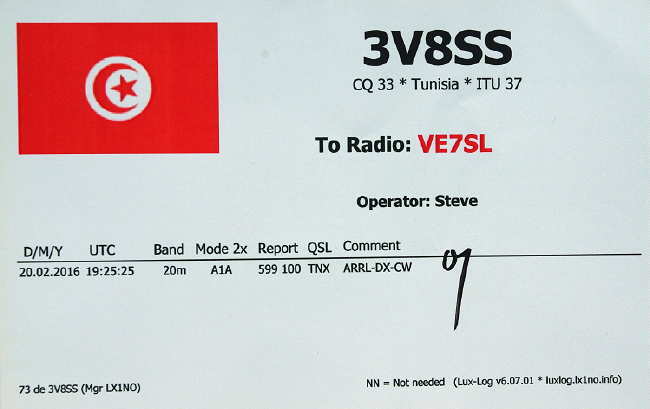 The contact with 3V8HQ was my first and only one with Tunisia, since being licenced in 1963. The low level of ham radio activity from 3V8 combined with the challenges of VE7 to Meditteranean Africa propagation, made it a difficult one to work. 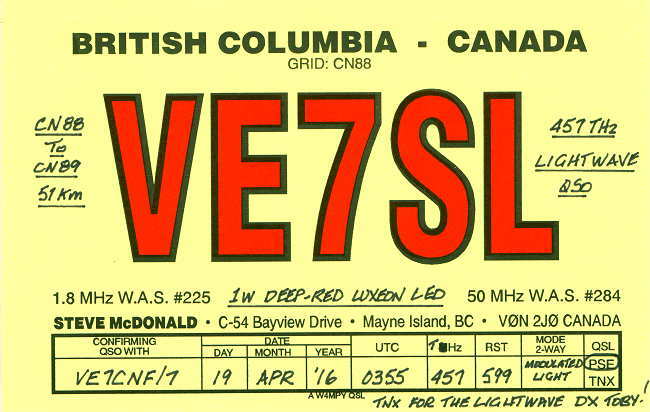 I was excited to see one other station becoming active this past year, club station 3V8SS ... but it seemed that whenever they were on (very early out on the west coast), they were on RTTY and not on CW. During the past recent ARRL CW DX test, I noticed that they were active ... a rare event and maybe another opportunity to work Tunisia on CW once again. As luck would have it, propagation was good enough to make the QSO, as my old (twice refurbished) Cushcraft A3S tribander came through once again. A couple of these have been active in past recent years ... for some, I was asleep at the switch and for others, I was away travelling at the time. With solar conditions heading downhill quickly, and possibly staying there for many many years, the prospects of working these last seven is looking pretty bleak. On the other hand, my favorite winter band (160m) should continue to improve. Last week also brought a new DXCC QSL for me on that band, A35T in Tonga, bringing my confirmed total on that band to 157. Getting new entities from here on out will be increasingly challenging ... I guess I need to remember, that if it was easy, it just wouldn't be any fun! Have you ever wondered where those odd stations found at the ends of the AM broadcast band might be located and what they're all about? These are 'Traveller Information Stations' or 'TIS's and, 'Highway Advisory Radio' (HAR) stations. Because of their low power (100mw - 10W), they make challenging DX targets if you can catch the ID on their continually- repeated audio loop. 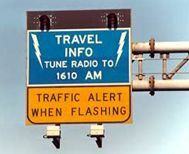 These stations are located throughout Canada and the USA at places such as highway intersections, border crossings, ferry terminals, airports and parks ... just about any place that needs to advise travellers (vehicles) with up-to-date directions or information. From here on Mayne Island, the farthest TIS I have been able to identify was WPTC509, located in Carbon County, Wyoming. 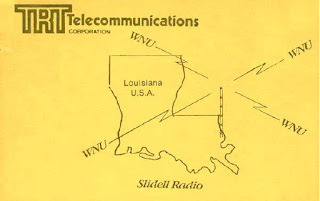 Thanks to the International Radio Club of America's (IRCA) Phil Bytheway, an up-to-date list (58 pages) of all known stations is available for download or, if you choose, as a purchased hard copy. The IRCA TIS/HAR LIST lists all US and Canadian TIS/HAR stations, by frequency, including call letters, state (province,) city, county, licensee, address, coordinates, expiration date and dates of DXM/DXN reports/sources. 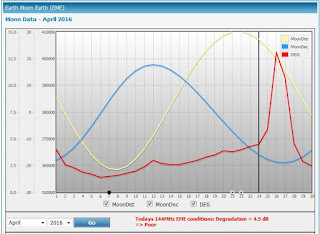 It has been updated with FCC data, DXM, DXN and DXer reports, and on-line listings through March 1 2016. The 2016 IRCA TIS/HAR LIST is posted on the IRCA website for all to download. The link is: http://www.ircaonline.org/TIS_2016.pdf. For those preferring a hard copy, one can be ordered from the IRCA. As well, this page on regulations, permitted content and TIS history has some interesting info. 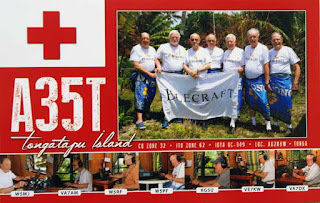 IRCA is one of the oldest clubs dedicated to DXing the broadcast bands and members receive a monthly journal of members loggings as well as other relevant articles. A trip to the IRCA website might get you hooked on this part of the radio hobby as it's probably the way that most amateurs discovered the 'magic of radio', on late winter nights! Just in case you need it, the mwlist will help you identify any stations heard in the AM broadcast band, worldwide. 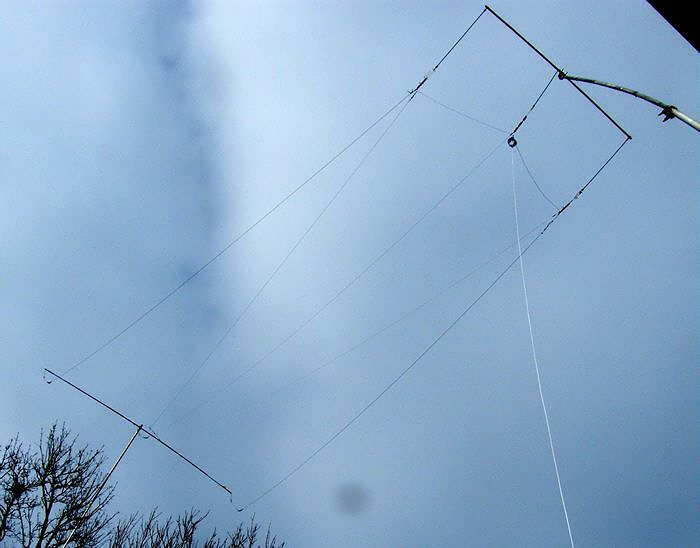 When it comes to discussion of 630m, the topic of antennas seems to top the list. One of the easiest ways to enjoy what 630m has to offer is to try and utilize a low band antenna that may already be in place. An 'inverted-L' for 80 or 160 can be readily bottom-loaded and with a few radials, can provide a good starting point ... but with a little additional work, its efficiency can be easily improved by expanding the top horizontal (top hat) section. Jim, W5EST, has posted an interesting description of the pros and cons of the 'top hat' in a recent KB5NJD daily 630m report. Those thinking about getting on the band or those considering ways of improving their present antenna might find the information helpful. Higher EIRP comes from a more nearly uniform current distribution all the way up a TX vertical. https://en.wikipedia.org/wiki/T-antenna . But remember that adding top hat doesn’t help you if your license is subject to a legal limit EIRP that’s reached by your station already. A vertical without a top hat has no current at its tip, meaning the upper part of a hatless vertical is inefficiently used. Average RF current for a hatless short vertical is only half what an RF ammeter shows at the antenna base. Top hat lets a shorter vertical antenna yield same total radiated power TRP by increasing its degree-amperes, as discussed March 31, this blog. 2 amperes of 630m RF base current in a 10° tall hatless short vertical can give 10 degree-amps (2 x ½ x 10°) and yield 15 degree-amps with an ample top hat. A top hat can increase average RF current by about a quarter to half, which could as much as double the TRP. Top hat increases antenna system capacitance. You get more flexible QSY by decreasing the system Q. SWR increases rapidly as your frequency departs from antenna system resonance, see graph Feb. 10, this blog. 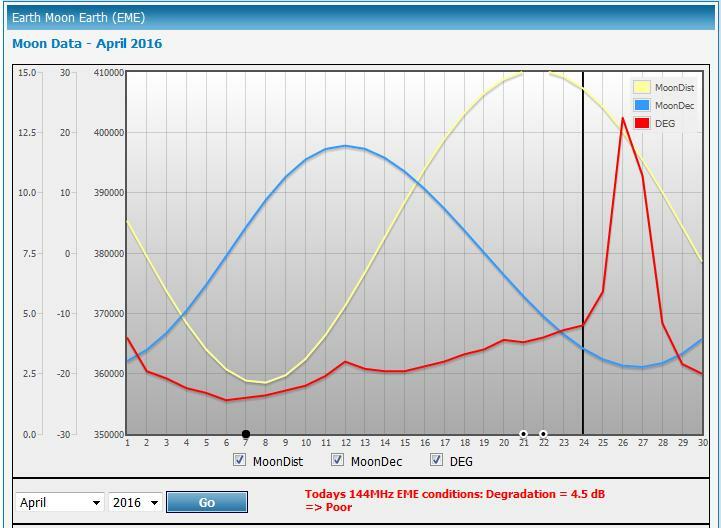 With lower system Q the SWR doesn’t increase so rapidly. Then you can QSY temporarily a little way without retuning or by just retuning a little in the shack instead of outdoors at the ATU. Decreased Q somewhat lowers antenna voltage KV from antenna base to top hat. On 630m Q = (2π 475)L/R by definition and Vantenna = 1.4 Q P / I < Vbreakdown. See Jan. 16, this blog. Top hat wires can be symmetrically or asymmetrically positioned to give approximately similar capacitance whichever way. I’ve not modeled the effect of a top hat on the azimuth and elevation antenna patterns of an electrically short vertical. I don’t think the effect is very significant. But if you know a link or some better information about this, let us know. If your radials have extended way beyond the extent of a small top hat high above, then providing longer top hat conductors above the radials can more efficiently utilize the radials. If the radials mostly go in one or two directions, then for highest antenna system capacitance the hat wires should extend in those directions to couple best with the radials. Your experience may suggest this last is not too important, especially if you have a perimeter conductor and/or several ground rods and your soil has favorable conductance. Another top hat advantage is that top hat conductors are compatible with structural support and stabilization for the very top of an MF/LF vertical antenna. You get added degree-amperes–and steadying at the top to boot. If the top hat slants upward, its system capacitance contribution is somewhat decreased compared to a top hat of same length horizontally, but the vertical slant contributes radiated power. Depending on the arrangement of antenna and trees on some properties, using a shorter vertical with an upwardly slanting asymmetrical top hat may make the antenna system both easier to guy and less obvious to neighbors. Putting in a top hat or improving a top hat increases the degree-amperes of a short vertical mainly by distributing the same RF amperes more uniformly. Adding more radials and longer radials decreases the antenna system resistance and increases the degree-amperes of a short vertical mainly by increasing the RF amperes of antenna current itself. A top hat obviously requires outdoor work to construct or revise it. You may be able to simply increase your transmitter power TPO more conveniently than to do the outdoor work. A top hat needs to extend more or less horizontally from the top of the vertical, although the angle is not too critical within +/-45°. Distant supports for the top hat at that top level may be unavailable or expensive and inconvenient to provide. If the top hat were attached to the vertical below the top of the vertical, the otherwise radiation-beneficial top segment of the vertical becomes mostly unused. If the top hat slants quite steeply downward, its effect on system capacitance may be a wash– more capacitance by closer approach to the ground and less capacitance because same length top hat conductor extends less outward over the ground below. That defeats a reason for putting up a top hat in the first place. Moreover, if the top hat slants steeply downward, then vertically downward RF current in the top hat cancels part of the radiation from the vertical antenna and at least partially defeats the improvement in vertical antenna current uniformity that the top hat is intended to confer. A long top hat may not fit on the available real estate. Even if it fits, it may add to visibility as far as difficult neighbors are concerned. Adding a top hat means you need to retune the ATU after the addition. But so does improving the radials or just about anything else you do. Top hat conductors add more weight on a vertical than lighter-weight guying does. The weight of the top hat likely adds to the support demanded of the antenna base. If you put downward-slanting top hat conductors under tension at their far ends to keep them from drooping in the middle, then a lot of that tension will be imposed on the vertical too. That can produce a buckling force on the vertical which may call for additional guying halfway up the vertical. Top hat conductors convey a declining but substantial RF current along their length. That involves I2R losses in the skin effect resistance of the top hat conductors. However, if your earth resistance is high or your radial/grounding system is not very elaborate, some loss in the top hat probably does not decrease the RF amperes of antenna base current very much at a given TPO compared to the improvement in radiation TRP that the top hat gives you. If skin effect resistance losses in the top hat are significant compared other losses in the system, reducing top hat losses generally means more conductors or heavier conductors in the top hat. That translates to more weight for the whole system to support. 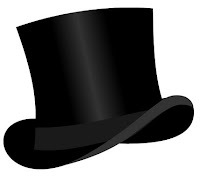 A top hat translates KV of antenna top voltage to its ends. If the top hat extends all the way to leaf cover of trees or shrubs, unexpected sparks might jump to them in quiet weather, or in windy weather, or sometime when such trees or shrubs grow nearer to the top hat end(s). Jim often adds an interesting op-ed piece to the KB5NJD daily report and sifting back through the past few weeks will provide some great 630m 'food for thought' bed time reading! 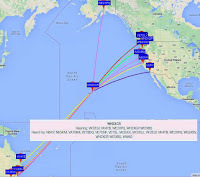 With the sun remaining reasonably quiet over the past several days, a sudden spike in the geomagnetic field on Saturday afternoon saw a number of trans-Pacific spots showing up on 630m WSPR mode. 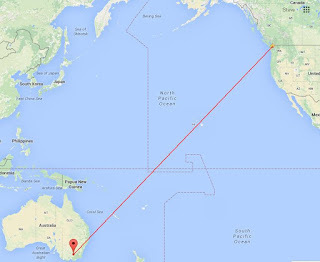 In the predawn hours of Sunday morning, my own system decoded the VK3ELV WSPR beacon, located in south east Australia, 12,992 km from here. From an e-mail exchange, it seems that VK3ELV is using a 'drifting' IC706M2G on 10Mhz with a VK3XDK Transverter into an old HF AMP (2x 2SC2290) modified for 630m. This is running about 130-140 watts output. The antenna is an inverted L about 30 metres high and 1/4 wave long. 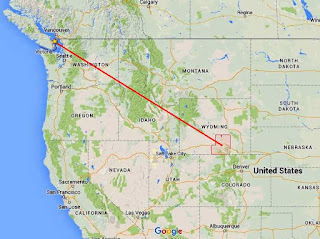 Further to my south, the WG2XGP WSPR beacon run by Larry, W7IUV in central Washington, was reported down under by two different VK's on Sunday morning as well ... VK4YB and VK2DDI, both some distance from VK3ELV. It's interesting to note the time difference for these receptions, with Larry's reception being several hours earlier than my own (1304Z), close to my sunrise. As well, the 'spotlight' effect of propagation over such a vast distance is somewhat intriguing. I would have thought that if I should see any VK's on 630m, it would be the closer ones and not the further one, yet it was just the opposite. Although VK3ELV's signal was right at the edge of WSPR decoding levels (-29db), it would only take a few more db to allow a two-way JT9 digital mode QSO to take place ... maybe something that will be possible in the coming years of solar minimum and much better LF/MF propagation. To be readable on CW would need an equivalent true power output increase of at least 16 times, requiring VK3ELV to run around 2,000 watts output! Over the years I have seen ZL6QH a number of times on 2200m (QRSS CW mode) but this is my first reception of VK and, hopefully, not my last. To keep up to date with overnight activities on 630m, visit the excellent site of KB5NJD. John posts a detailed daily summary of events. 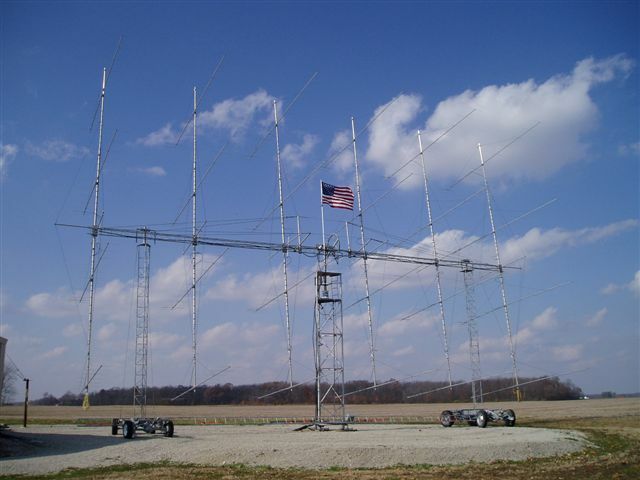 In addition, you will find some excellent resources to help you get involved in this part of the spectrum ... and remember, you don't need a big backyard or a big antenna to have fun on 630m. It seems that contesting clubs in Manitoba and New England want to show non-hams, new hams and all hams, the 'joys of HF radio'. In a beta test of their idea, called 'Discover the HF Experience', participants in Manitoba will have the opportunity to get on HF by operating K1K, in Massachusetts, remotely, from the Garden City Canada Inn located in Winnipeg, Manitoba, on Saturday, April 2nd. Future events will take place in Massachusetts from the Yankee Clipper Contest Club's venue on April 10th and a much larger operation, featuring four operating positions at Dayton in May, at the ARRL's Expo site. Full details of all operations can be found here. The idea was the brainchild of Gerry Hull, W1VE who, along with Cary Rubenfeld, VE4EA, has brought his idea to life. Now I fully concur that far too many of our newest amateurs land on VHF or UHF and never move, almost totally unaware of what HF radio is all about. Being exposed to HF radio is a great idea, yet ... and maybe I'm just old-fashioned, but I'm not sure that this 'first experience' is best done via remote operation. From my own initial exposure to ham radio, seeing the magic happen in a basement or attic radio shack, complete with glowing dials and a wall full of QSL's from all over the world, was enough to hook me for life. I'm pretty sure that same feeling can't be conveyed by sitting in front of a laptop and pushing a few keys. I am not a fan of 'remotes' but from what I have seen, this may be one of the better examples and if it grabs and convinces even a few to explore HF on their own, that would be a good thing ... then all we'd have to do is get them on CW !